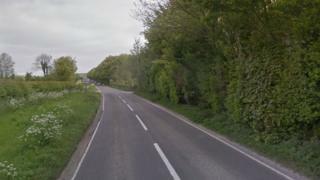 A 70-year-old man has died in a crash involving a car and a lorry in Dorset. A man and a woman were trapped in a Peugeot 207 when it collided with a Mercedes lorry on the C13 near Fontmell Magna at about 12:22 GMT on Friday. The man died and the woman, aged in her 60s, was taken to hospital with life-threatening injuries, Dorset Police said. Sgt Lee Savage has appealed for witnesses or anyone with dashcam footage to contact police. The lorry driver was not seriously hurt and the family of the 70-year-old man, from Bath, were being supported by specially-trained officers, the force said.